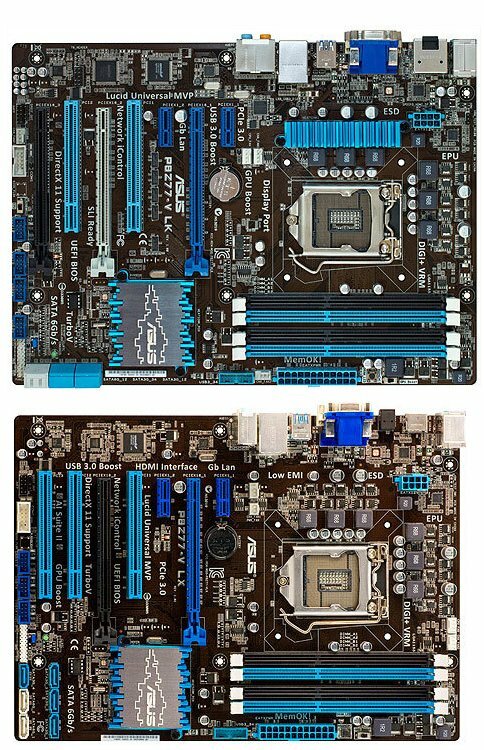 ASUS is working on two new budget P8Z77-V series LGA1155 motherboards; the P8Z77-V LK and P8Z77-V LX. Both motherboards will be sold for well under $150, full details and more pictures over here. The P8Z77-V LK is the costlier of the two, featuring three PCI-Express 3.0 x16 slots (x16/NC/NC or x8/x8/NC or x8/x4/x4), 6-phase CPU VRM, six USB 3.0 ports, two SATA 6 Gb/s and four SATA 3 Gb/s internal ports; and display outputs that include DVI, D-Sub, HDMI, and DisplayPort. The P8Z77-V LX is probably ASUS' cheapest Z77 motherboard, with the same 6-phase CPU VRM, but a single PCI-Express 3.0 x16 slot wired to the CPU, a PCI-Express 2.0 x16 (electrical x4) wired to the Z77 PCH, three PCI, two PCI-Express 2.0 x1, all internal ports wired to the PCH (2x SATA 6 Gb/s, 4x SATA 3 Gb/s), and a slightly slimmer connectivity loadout that includes 6-channel HD audio, four USB 3.0 ports (2x rear, 2x front-panel, all from PCH), and display outputs that include DVI, D-Sub, and HDMI.